Your full-day tour begins with pickup anywhere you're staying in downtown Toronto. Travel in one our of modern, fully air-conditioned vehicles to Niagara Falls, located 1.5 hours away. 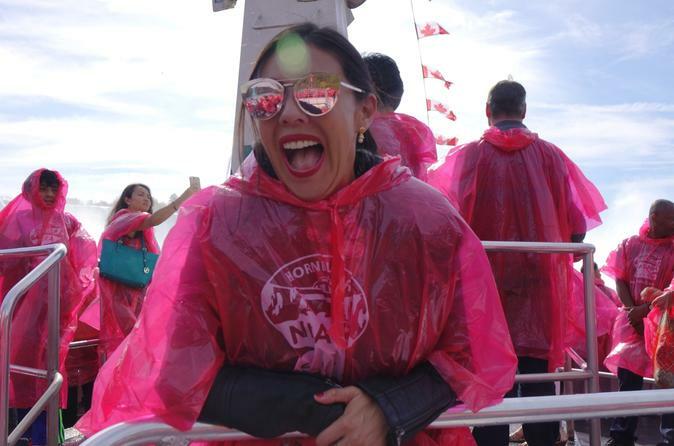 Upon arrival in Niagara Falls, you'll receive admission and priority access to the world-famous Hornblower Niagara Cruise boat tour. Experience the thrill of the most powerful waterfalls in North America, and learn about the daredevils who tried to conquer Niagara Falls. You'll also have leisure time to experience Niagara Falls on your own. In the afternoon, we'll make several photo stops at the Floral Clock and Whirlpool Rapids observation deck while traveling along the beautiful Niagara Parkway before stopping in Niagara-on-the-Lake, considered one of the prettiest towns in Canada. You'll return to Toronto by 6:30pm with drop-off anywhere in downtown Toronto. This tour is ideal if you're looking for a small-group tour (maximum of 14 guests) with complimentary door-to-door service anywhere in downtown Toronto and the support of one driver and one tour guide with every group.